I thought I should make an effort to cook some traditionally Scottish food for St Andrew's Day. So for lunch we had Scotch Broth, which consisted of about half a head of celery (just because it was in the fridge), carrots, onions and approx 250g of Broth mix (split yellow and green peas, red lentils and pearl barley) soaked in water overnight. Cook the vegetableson a medium heat in a little vegetable oil for about 10 minutes, add about 1.5 litres of chicken or vegetable stock. Now I cook mine in a pressure cooker for 15 minutes, but it will probably take about 40-50 minutes without one. Add some chopped parsley when the soup is cooked. I decided that the most Scottish of meals is 'Mince and Tatties'! In my childhood this was staple fare and is much more what people in Scotland would eat rather than haggis which is an occasional meal rather than everyday food. People are very divided by how they like their mince, thick gravy or thin gravy? carrots or not? onions or not? For those of you unfamiliar with 'mince', it is ground beef, beef which has been through a mincer, usually at the butchers shop. You very simply cook the onion in a little oil, until soft but not brown, then brown the mince in the pan breaking it up as you do so. Add carrots, if liked, and a thickening agent (Bisto or flour) and beef stock. Cook for about 20 minutes at a gentle simmer or until the carrots are cooked. Tatties are, of course, potatoes and served mashed with milk and butter. I also served boiled carrots with the mince & tatties tonight, but usually I would serve cabbage. As I unwell with a bad cold on Friday and Saturday, my husband did the shopping to a list and I forgot to put the cabbage on the list! Here is somemore information about St Andrew's Day, unfortunately I don't get this holiday. The Scottish flag, or Saltire, is flown on public buildings in Scotland on St Andrew's Day. In the rest of the United Kingdom, the British Union Flag is flown. Some people have a day off work in Scotland. In Edinburgh, there is a week of celebrations, concentrating on musical entertainment and traditional ceilidh dancing. A ceilidh is a social event with couples dancing in circles or sets (groups of eight people). In Glasgow city center, a large shindig, or party, with traditional music and a ceilidh are held. In Dumfries, songs are performed in the Burn's night tradition. There is a lot of folklore associated with St Andrew's Day, particularly around young women, who hope to marry. At midnight, as November 29 becomes November 30, young woman prayed to be shown signs about their future husbands. They peeled an apple in such a way that the peel remained in a single piece and threw this over their shoulders. The shape that the peel formed on the ground indicated the first letter of their future husbands' names. They also dropped molten lead or candle wax into a bucket of water. The shape that it formed indicated the profession of the men they would marry. St Andrew's Day is a bank holiday in Scotland on November 30. If November 30 is on a Saturday or Sunday, the bank holiday falls on the following Monday. The amount of disruption to public life varies greatly. Generally schools are closed. Some other organizations and businesses may be closed, but others are likely to be open. Public transport services may run to their usual or holiday timetables. Those intending on using a particular transport service on St Andrew's Day are encouraged to check ahead on the service's availability. St Andrew's Day is not a bank holiday in England, Wales and Northern Ireland on November 30. St Andrew was born in Bethesda on the shores of the Sea of Galilee and was the younger brother of St Peter. Both he and his brother became disciples of Jesus. He is said to have died bound to an “X” shaped cross at Patras in Achea in Greece. This shape is now reflected in the Scottish flag, known as the Saltire. St Andrew has been recognized as the patron saint of Scotland since at least the ninth century. The bill to make St Andrew's Day a bank holiday in Scotland was first introduced in 2003. In 2005, it was rejected by the Scottish Parliament on its first reading. The main objections were that the introduction of another bank holiday would have a negative impact on the Scottish economy. After further negotiations, the bill was supported by the First Minister of Scotland. One of the results of these negotiations was that the new law should not give employees an extra holiday, but that a holiday on St Andrew's Day should replace an existing local holiday. The St Andrew's Day Bank Holiday (Scotland) Act 2007 was passed by the Scottish Parliament on November 29, 2006. It was given Royal Assent by Queen Elizabeth II on January 15, 2007. The first St Andrew's Day bank holiday was observed on November 30, 2007. The Scottish government used this as an opportunity to support celebrations of Scottish culture all over the world. 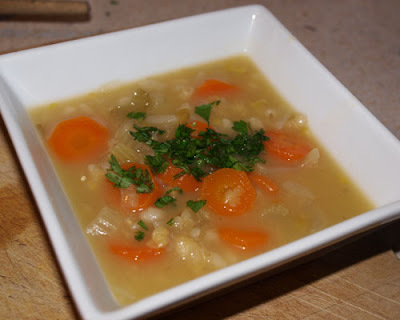 Lovely picture of your Scotch Broth! The colours are gorgeous. lovely food and fascinating history love the apple trick! I love reading about St Andrew's Day! The Scotch Broth looks really good and the Mince and Tatties seems like such a yummy comfort food. Great post! Mmmm, the soup looks lovely (not so sure about the rest ;o). Happy St Andrew's Day to you! I love the colour of your soup. It looks fresh, colourful and delicious. I love quite a few Scottish food. More to learn. Thanks for sharing. Oh my goodness! 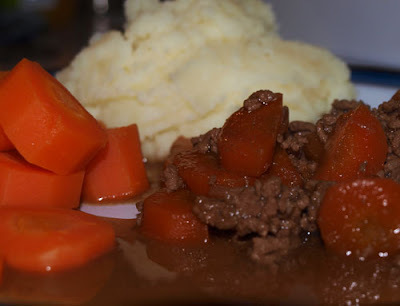 Mince meat and mashed or boiled potatoes. I grew up eating this! I love it. My father, first generation American from Scottish family, grew up eating this so of course so did I since my mother had to learn to make it. First time I was in Scotland I was very sick with a horrible cold and sore throat. Went into a small restaurant in Edinburgh and couldn't find anything on the menu I thought I could swallow. My father asked them if they had mince meat and potatoes and when they said "yes" I thought the world was a very good place indeed. How interesting! I really enjoyed Scottish cuisine when I visited that beautiful country several years ago! Bring on the mince and tatties AND the haggis! Thanks for sharing the culture and the traditions of this Scottish Holiday. The mince and tatties and the scotch broth look very warm and comforting. Very imformative post Janice, and I love the looks of that Scotch Broth! Much better than anything in a can I'm sure! The mince and tatties look delicious as well and I am betting even better with cabbage. Oh, it does sound wonderful!! Janice,Thanks so much for this post. I feel I have been enriched with cultural information and I really enjoyed it.